"A UFO with white lights, blue and yellow flashes" -- The first report was received from the airport area, and [the object] was even seen by C-4 operators manning the safety cameras that appear to have recorded it. The sighting prompted the mobilization of police officials. Martin Ruelas, supervisor of the western sector, was able to see it with his own eyes, but it was too fast and it was impossible to follow. 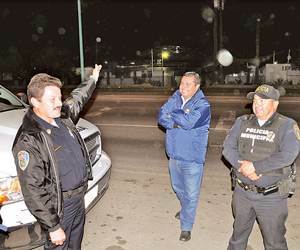 An Unidentified Flying Object (UFO) prompted an intense mobilization by elements of the Public Safety Forces of the City of Mexicali, arising from citizen reports about the presence of a strange device in the air. Alejandro Monreal Noriega, general commander of Patrols in the Dirección de Seguridad Pública Municipal (DSPM) reported that the first news item was received from people living in the vicinity of the airport. Even C-4 operators, responsible for urban security cameras, saw the object in their systems and it appears to have been recorded. Furthermore, hundreds of phone calls were received at the "066" number, reporting the flying object's presence. It was seen around the airport and subsequently flying at dizzying speeds toward the new guard post after citizens reported seeing it over the Marán Industrial Park, and subsequently in the Rivera Campestre district and related areas. Martin Ruelas, supervisor of the DSPM's western region, saw it and stated that it was a sizeable round white object with visible blue and yellow flashes. He added that the object was seen high in the sky and moved up, down and sideways at very high speeds, vanishing from sight after heading south from the valley of Mexicali. Deputy Commander Medina, from the valley's southern area, also saw it and said it was too fast and impossible to follow, as it changed direction suddenly. A "chase" by patrolmen ensued, but since the object changed position within seconds, they simply relayed its location in order to have the nearest unit continue the report. Unfortunately, it was impossible to obtain an answer. Monreal Noriega stated that consultations were made with airport authorities and SEDENA, as well as their U.S. counterparts, and they awaited more information on the subject.